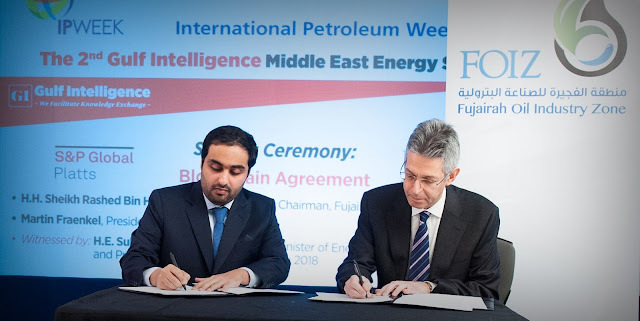 LONDON (22 February 2018) – S&P Global Platts, the leading independent provider of information and benchmark prices for the commodities and energy markets, today announced that it is deploying a proprietary, secure Blockchain network to allow market participants to submit weekly inventory oil storage data to Fujairah Oil Industry Zone (FOIZ) and the regulator, FEDCom. FOIZ hosts the Middle East’s largest commercial storage capacity for refined oil products. As exclusive publisher of FOIZ's weekly oil inventory numbers, S&P Global Platts continues to partner with the Emirate in its journey to becoming a global trading hub. In collaboration with FOIZ, FEDCom and the 11 terminal operators that use the flagship Middle Eastern facility, S&P Global Platts has developed a full-scale commercial deployment of the Blockchain distributed ledger technology. This offers FOIZ and its port operators security, together with ease of use, and a full audit trail to collate weekly inventory oil products storage data. The new technology improves the manual and unstructured process by which the terminal operators communicate their weekly inventory numbers to FEDCom. The new solution also alleviates the need for FEDCom to undertake manual validation and aggregation of each terminal operator’s numbers, reducing the scope for human error. Simplifying the certification of asset ownership. As in the current process, FEDCom will have sole access to all individual terminal operator numbers and will submit only the approved aggregated weekly numbers to S&P Global Platts for global distribution. Built on the opensource hyper ledger Fabric framework, S&P Global Platts has developed a permission submissions environment where terminal operators submit data to FEDCom through smart contracts on individual private channels. FEDCom, in turn, runs a second smart contract, with an automatic command to calculate and submit data to S&P Global Platts on a public channel. This provides additional security and convenience for terminal operators. S&P Global Platts has a long history driving technological evolution across commodity and energy markets. The division was the first commodity news organization to harness satellite transmission of oil prices in real time in the 1980s. It was present at the inception of electronic solutions for commodity trading, which have evolved as many global markets have embraced the eWindow online communications tool that brings greater speed, transparency and efficiency to the Market on Close price assessment process.